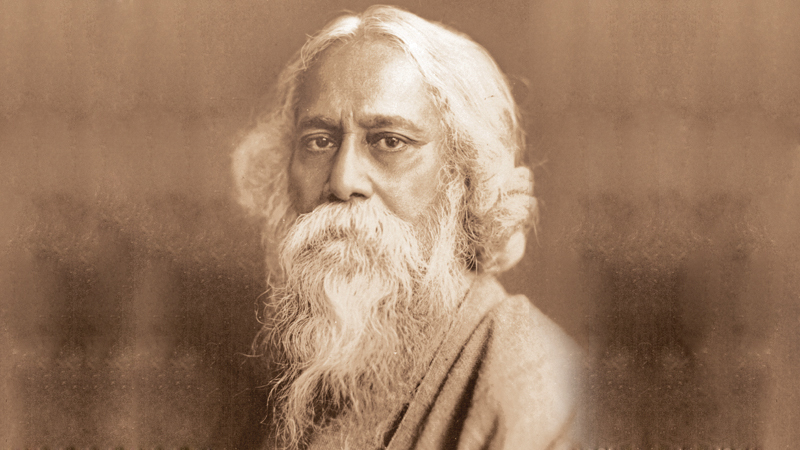 Tagore’s creative talents witness the quality of reputed work, Gitanjali, with profoundly sensitive, fresh and beautiful verse. He is more often referred to as the “Shakespeare of Bengal” by the outside India. Tagore restructured and modernized Bengali art by spurning inflexible and traditional classical forms and resisting linguistic structures. The earliest extant work in Bengali literature is the “Charyapada” (or Charyagiti, composed by 23 poets), a collection of Buddhist mystic songs inspired by Mahayana tantric traditions, dating back to the 9th Century. After the medieval centuries the time line of Bengali literature is divided into two periods. The Bengali language uses the Devanagari style like Sanskrit and Hindi. Today, the Bengali claims a rich heritage of language and literature, in the Indian subcontinent. According to the official statics (2017) 300 million people speak Bangali, the mother tongue of Tagore, becoming known as the 7th World Language, following Chinese, Hindi, Spanish, English, Arabic and Portuguese. The 7th place of the Bengali language, in the Indian subcontinent, was an additional favour to the local writers for their publications. “Rabi” (nickname of Tagore) was the youngest child of Debendranath Tagore (father) and Sarada Devi (mother), in a big family of thirteen children. In his early childhood Rabi’s mother had died and “Rabi” was raised by servants. There were regular visits of tutors and musicians at home. The doors were open to the Hindustani classical artists and “Rabi” grew up in an intimate group of family music band. His elder brother Dwijendranath was a philosopher and poet, a decent character with good temperament. Satyendranath, another brother, was the first Indian appointed to the Indian Civil Service. Jyothirindranath became a famous musician in the region who was a composer and a playwright and his wife Kadambari Devi was very dear to younger “Rabi”. His sister Swarnakumari was a novelist. This small child was particularly influenced by these two ladies as Tagore had only a memory of his late mother. Tagore preferred roaming and observing natural beauty in their lands and nearby villages, than classroom. Another brother, Hemachandranath was the cherished friend than a brother and he was very careful about “Rabi” and he had a high regard for his younger brother’s adventures like swimming in Gange or passing through hills near Bolpur or Panihat. The two brothers practiced gymnastics, Judo and wrestling. The young Tagore had a great literary background of Indian philosophies and religions such as Hinduism, Jainism and Buddhism. His mother tongue was refined through many centuries by Vedic Sanskrit, Hybrid Sanskrit and number of other Indian dialects both Aryan and Dravidian. As a result, he was extremely keen in writing even at the age of eight and he could release his early substantial collection of poems at the age of sixteen. In this work he used the pseudonym “Bhanusimha” (Sun Lion). But by the same period he published his first short stories and dramas under his authentic name. Through these early literary works he confirmed, what is more, his personal quality as a Humanist, Universalist, Internationalist and fervent anti-Nationalist and in addition he was an ardent young scholar who condemned the British rule. Tagore was an extraordinary supporter in the campaign of the Bengal resurgence using his entire vitality to bring a new beginning to the nation through his artistic creations. Paintings, sketches, a large number of texts and essays, and thousand of songs were followed by the then young generation. As an initial step to the higher education he gifted his country and the world, “Shantiniketan”, and later “Vishva Bharti” University that was inaugurated in the same premises. This most renowned Indian University has produced a great generation of alumni, Bengali and Sri Lankan, that includes Nobel Prize winning economist Amartya Sen, globally reputed filmmaker Satyajit Ray and the country’s foremost art historian R. Siva Kumar, to name just a few. Tagore’s attractiveness and popularity gave more and more young Sri Lankan students to realize their dreams at Shantiniketan to study music, drama, dancing, painting and philosophy as well as religion. Among the former students of Tagore, Ediriweera Sarachchandra, Ananda Samarakoon, Sunil Shantha, L.T.P. Manjusri, Lionel Edirisinghe, Chitrasena, W. B. Makuloluwa have done a great contribution to the promotion of Sri Lankan culture, education and administration. Yasunari Kawabata was a Japanese novelist and short story writer who won the Nobel Prize in 1968. Kawabata treasured memories from his middle-school days of “this sage-like poet”. Juan Ramon Jiminez was a Spanish poet who was awarded Nobel Prize in 1956. In 1913, he and his wife-to-be had begun translating Gitanjali. It is commonly accepted that Tagore had enormous influence on Latin American poets. In a lecture on Tagore’s manuscripts, given at the University of Delhi by Octavio Paz, he highlights “Although Rabindranath has influenced some of our Hispanic-American poets, none of our poets have had any kind of influence on him”. Tagore regularly advised his students to break away from the traditional concepts of arts and literature and to experience one’s own creation through profound introspection. His novels, short stories, songs, dancing, dramas and essays discuss fresh themes not traditional. The topics are based on the modern society, political, social or personal. He argues in his works the themes like nationalism, the turbulence of imperialism and the importance of fresh artistic creations in order to awaken the mind. He was the only lyricist or bard and musician welcome by the neighbouring countries to compose their national anthems: “Jana gana mana abhinaayaka jaya hey”, Indian and “Amar shonar Bangla, ami tomay bhalobhashi” Bangla. Sri Lankan National anthem was also inspired by Tagore’s work. Tagore had to take more and more efforts to develop “Vishva Bharati” and he was facing enduring difficulties to fund this institution. Today there are 32 Universities in Bengal. The foreign academic experts have also well recognized the Bengali studies all over the world, i.e. the world universities are offering courses and organising research works in different level of degree programmes. Among them, the Department of South-Asia of the Faculty of Language and Civilizations at University of Paris (Sorbonne); St-Petersburg State University in Russia; Faculty of Oriental Studies in University of Oxford; South-Asian Department in University of Chicago; Institute of South-Asia in University of Berkley; SOAS University of London; Tokyo University of Foreign Studies and Goethe University of Frankfurt are a few of them. The above dynamic educational and cultural relations on international arena attest also the enthusiastic diplomatic relations of the Bengal government, a heritage of the thought of Tagore. Tagore himself had a great attention and concern regarding the people of Sri Lanka. Once he regret for not being able to communicate in Sinhala. He was very interested in some aspect of Sri Lankan Buddhist culture influenced by local traditions, ritual items as well as the Mahayana and Hindu customs. He also had a fascination of Sri Lankan history which had begun by the arrival of Vijaya, the leader of Sinhala immigrants came from Bangali (Vanga Desha).